How do I raise a capable, grounded child? How can I get kids to do chores without nagging or removing privileges? What can I do about power struggles or kids who won’t listen? You are not the only family who faces challenges with your kids! Good news: Positive Discipline (PD) parenting skills that can bring some harmony into these relationships. 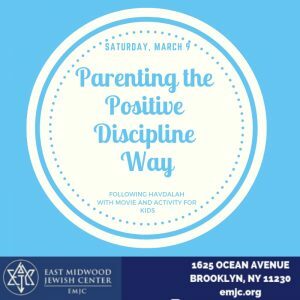 This 1 1/2 hour workshop is a great introduction to the positive discipline approach. You will learn some basic concepts of PD, participate in experiential activities, and go home with some useful tools to improve the climate at home. Led by Mary Lynn Fiske, a Positive Discipline Parent Educator, Positive Discipline Classroom Educator, childbirth educator and doula. She has two children. Open to up to 30 parents. There will be a movie and/or activities available for kids.